There's a glimmer of hope that Texas can win the West, so let's break down how. 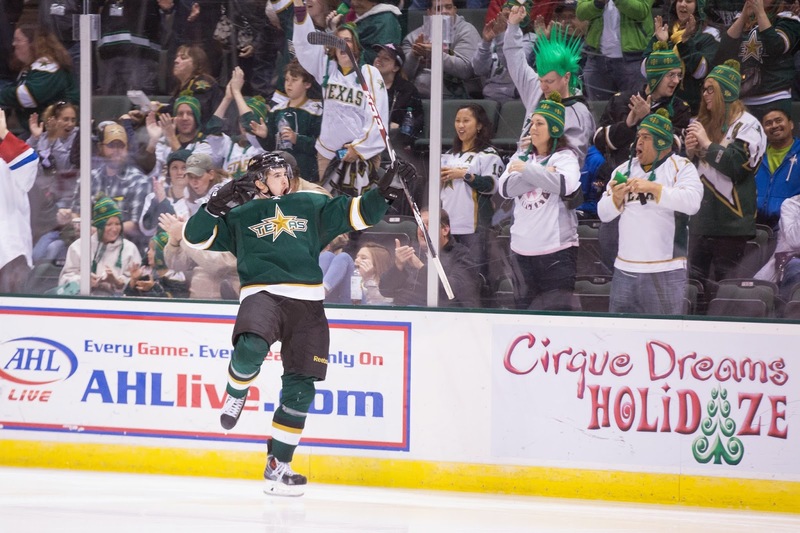 Changing fortunes in the AHL's West Division have put the Stars in control on their own destiny in many ways as it pertains to the West Division crown. 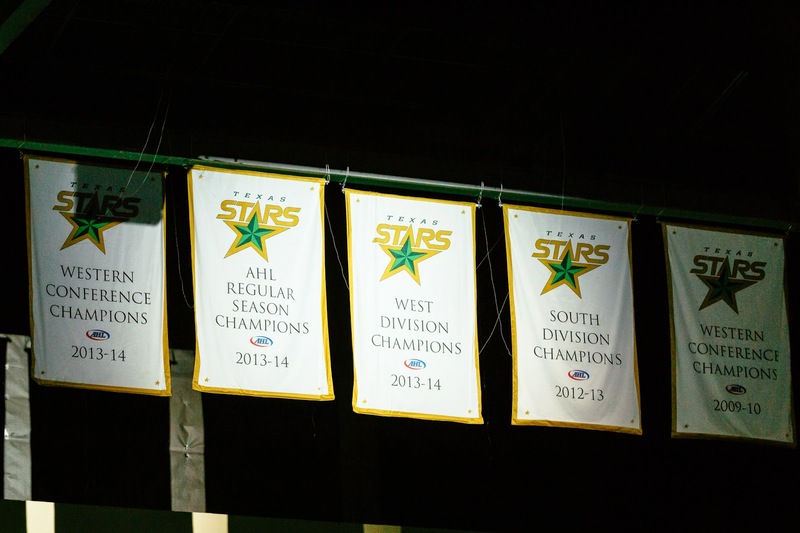 The Stars have won their division each of the past two years and, at least a month ago, appeared they would not be able to defend that title. Now, things have changed a bit. Absurd amounts of injuries for the Oilers and Barons have put them in a precarious state. OKC had led the conference for most of the year but has now dropped to fourth place, seeing San Antonio pass them for the division lead. 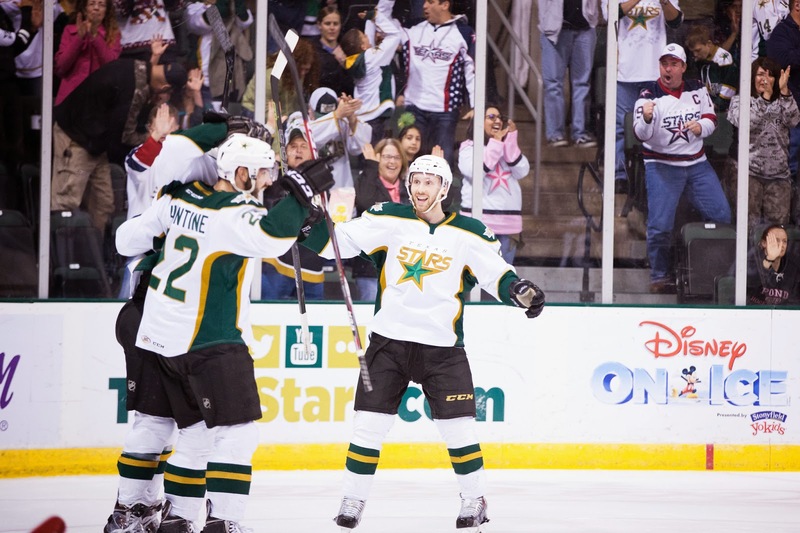 They are on a five game winless skid and are 7-10-2 since last playing the Stars in early February. For this scenario to work out, you need to assume that this trend continues for the Barons. They, of course, notably just signed a 40-year old to a PTO to fill some injury holes, so it's not happy times in Bricktown at the moment. Texas has no more games against OKC, so the Stars can't help their own cause directly here. All they can do is hope the Barons' luck continues. Now to toppling the current clubhouse leader: San Antonio. The Rampage are having a bang up season. They lead the league in goals for, which is just something really awesome to behold, and are tops in the conference by points as of this morning. They show no sign of going down easy on their own accord. They're on a six game winning streak and are 9-1 in their last ten. This is where Texas has to help itself. If everything plays out as it has been until game 73, the Stars will have 88 points and the Rampage will have 95. Those of you with the schedule committed to memory already know where this is going. For everyone else, I only carried the average out to 73 games because games 74, 75 and 76 are all against San Antonio. If San Antonio doesn't quite make it to 95 or Texas gets higher than 88 by game 73 (or any other scenario that sees them 5 or fewer points apart), then oh boy. Those last three games are a mini playoff series, and the stakes are the division title. Texas will need to win on points because the Rampage own the first tie break: regulation and overtime wins. San Antonio has more shootout wins than Texas but also more wins overall, making it a moot point. It's slim chance, but there's a chance. I've mentioned a few times now that Devin Shore and Branden Troock were roommates during Development Camp. One other connection that Shore shared with me was that he stayed at Matt Mangene's apartment when he went on his official visit to the University of Maine three years ago. One of the big advocates for bringing Derek Hulak to Texas was Willie Desjardins, who also attended the University of Saskatchewan. Hulak shared that when he arrived at practice his first day, Coach Desjardins told him that he'd streamed the whole CIS championship tournament from Texas, rooting for Hulak and the Huskies. Hulak mentioned that Coach Desjardins won a lot of the same team awards that Hulak did to end his season at Saskatchewan. That set up a bit of a rivalry-in-jest between the two. 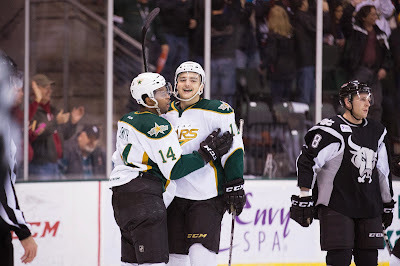 Branden Troock celebrates a goal with Gemel Smith. Rookie Branden Troock has had quite a week. Quietly, Troock has been one of the best players on the Stars' squad. This week, he potted two goals and an assist, including the game winner in Tuesday's 4-3 win over Iowa. He's been defensively responsible, going plus-3 on the week, one for each point. He's found a quick chemistry with Devin Shore, who also garnered strong consideration for the Player of the Week honor. 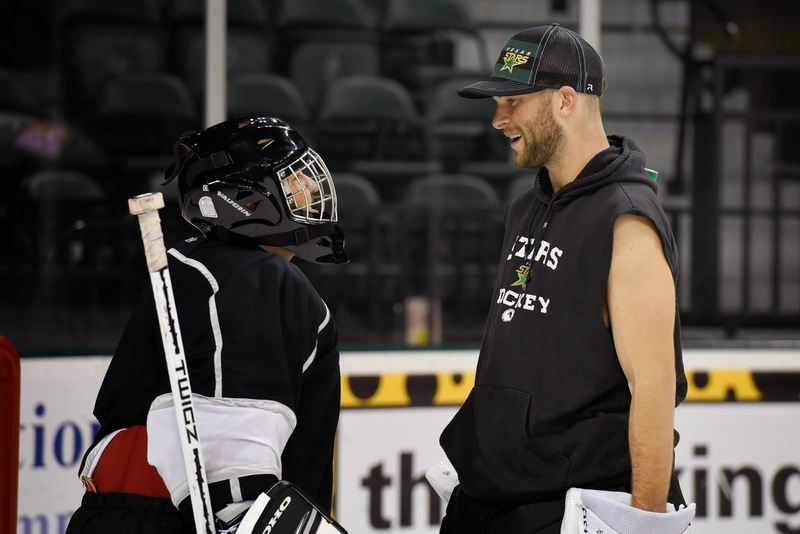 Shore and Troock were roommates at the past three Dallas Stars development camps and seem to have carried that connection with them onto the ice. 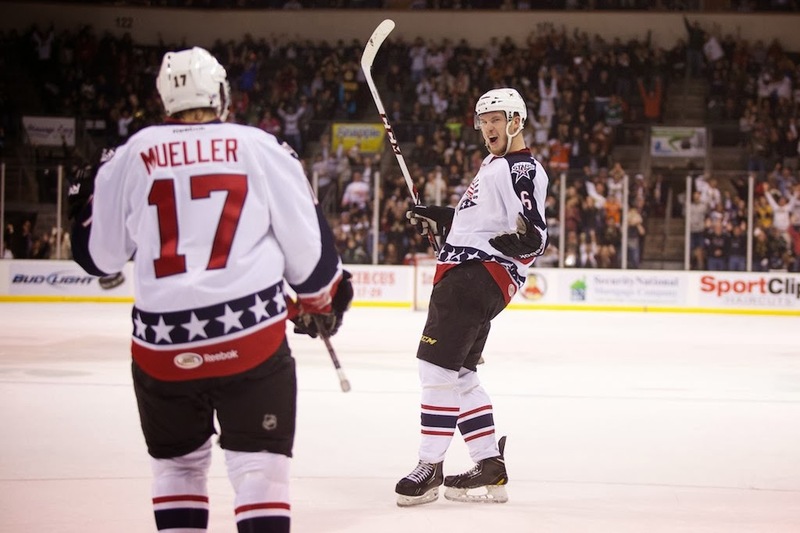 Troock began the year as a fourth liner and even spent some time in the ECHL in early November. Since then, he's found a groove and parlayed that into solid third line time. There is a lot to like in his game. He's a big physical winger, but he clearly also has a knack for scoring goals when called upon. Going out on a limb, I could see him acting as a net front guy next year for the Stars' power play. 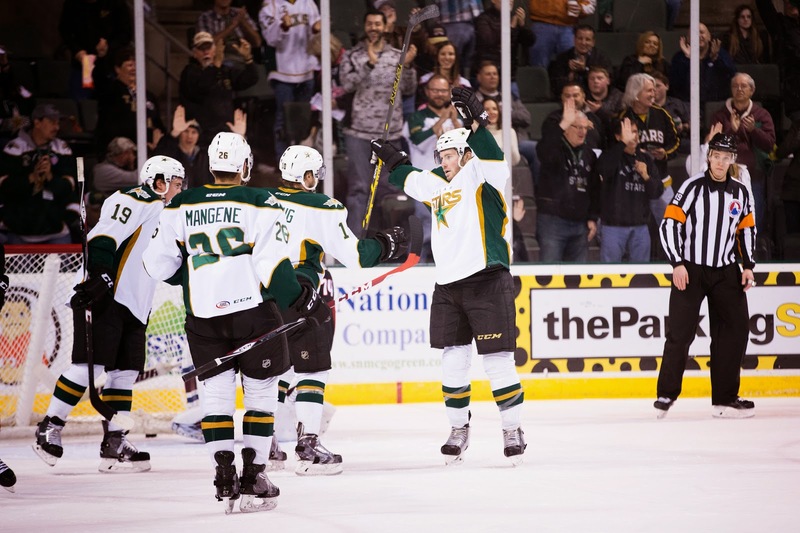 Can Texas continue their improbable streak this afternoon in Rockford with their seventh straight win? Jack Campbell will be key to the chances of that as Texas looks for his fifth straight win since returning from the ECHL. The IceHogs have a different look since the last time these two clubs faced off. Some moves by the Blackhawks moved TJ Brennan and Klas Dahlbeck out of the lineup. That hasn't changed much for their winning ways. Since these two last played, Texas is 6-0-1 and the Hogs are 4-1-1. Depending on how the rest of the season shakes out, it is entirely possible this is a first round playoff matchup in the 4v5 match. Texas faces another team they've vaulted in the standings for another head-to-head 'four point game'. Last weekend, these two squads faced off in Cedar Park, and Texas came away with two big wins. Milwaukee was on a five game skid after that second loss but bounced back against Oklahoma City on Tuesday night. 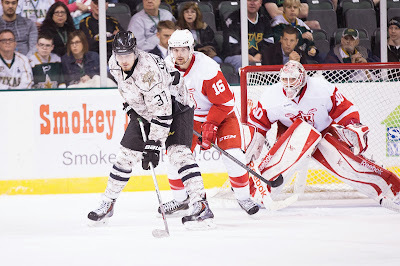 The Ads will be coming in on short rest; they played last night in Grand Rapids and lost 3-1. One piece that isn't helping the Ads' case is the loss of Viktor Arvidsson. The first-year right winger had two goals and an assist last weekend against the Stars but was recalled to Nashville earlier this week. One point bolstering the lineup for Milwaukee is the addition of longtime Ad Scott Ford, who had been playing in the ECHL all season. The former captain of the Milwaukee squad is playing his first AHL action of the year this week. It's an emotion add from the Admirals. 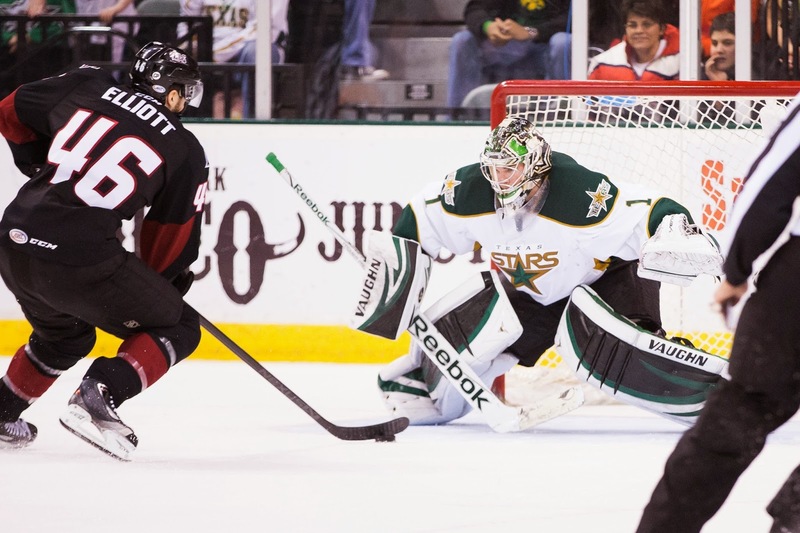 On the Stars' side, the big story is the play of Jack Campbell. The young American had a shutout in his last contest and now has a 1.07 GAA and .970 SV% in three games in the month of March. Campbell figures to get today's game and tomorrow's as well. Can he continue to fuel this club's climb back into playoff position and beyond perhaps to home ice advantage? From the greatest adversities can come the greatest chances for glory. In the final two minutes of the first period, Texas lost their starting goaltender, Jussi Rynnas, to a lower body injury as he was toppled by Lake Erie's Sam Henley. In stepped Jack Campbell, who was coming off his first win since December in what has been a rough season for the top pick. Campbell stopped 35 of 36 in relief plus 3 of 4 in the shootout to claim his first back-to-back victories since April 2013. "It's always nice to step in and help the team the best you can," said Campbell, deflecting some praise. "It's a big win, and we'll take it. For the team's sake, it was awesome, and personally it feels nice. It feels so good to step up when the team needs me." Campbell played a strong aggressive game. The only shot that beat him in regulation and OT was a point-blank blast that he had no chance on. After hitting the end of regulation, Texas decided to play a more aggressive game overall in the overtime period. Coach Laxdal said, "I told the guys, 'What do we have to lose in OT?'" The attitude was typified most accurately in the two homerun passes that Jack Campbell attempted in the 3-on-3 segment. Travis Morin described the scene, "Standing around while they're scraping the ice [Campbell] said, 'If I get it and catch it, just go.' and I said, 'Alright, I'll go.' He made an unbelievable save and then threw it up." Campbell looked down and out late in the OT, but made an incredible glove grab and popped to his feet to find Morin on a breakaway. The shot ended up in Pickard's chest, but it was an exhilarating moment that Coach Laxdal pointed to as an example of why the NHL should move to 3-on-3 OT. In the first period, Branden Troock had a nice 2-on-0 goal with newcomer Devin Shore on the assist. With the man power set at four each, Shore broke in with Troock against Pickard. After three passes between them, Troock buried the puck glove side for the 1-0 lead. Texas found themselves on the penalty kill in the middle of the frame. Sam Henley took the first of his cut against the Stars with a power play goal on that shift with just four seconds left in the kill. With the score tied at one, the second cut came when Henley bowled over Jussi Rynnas and landed awkwardly on the keeper, who immediately looked to be in pain. Rynnas went off limping, and Jack Campbell entered the game. "Once and a while the team needs someone to step up," said Campbell. "[Lake Erie] came out ready to play tonight and put a lot of pucks to the net. Sometimes you have to make more saves than the other guy, and I'm so proud we got the win." In the second period, the team traded power play goals. Cameron Gaunce, earning time on that second power play unit again, scored from the left point. His tally was as much his doing as the work of Brendan Ranford on the screen in front. Unfortunately, that work was undone later in the period when the Stars all got caught below the goal line on the penalty kill. That left Stefan Elliot wide open on the right wing hashes. Ben Street sent him a nice pass, which Elliot had time to skate into for the one-timer past Campbell. The Texas netminder had no chance on the shot from point-blank range. Jack Campbell continued to endure the barrage from Lake Erie in the third, stopping all 15 shots he faced in the frame. Overtime came and Texas had further theatrics from Campbell as the best two chances of the period came in rapid succession with Campbell's aforementioned save and Morin's breakaway off the pass from the netminder. 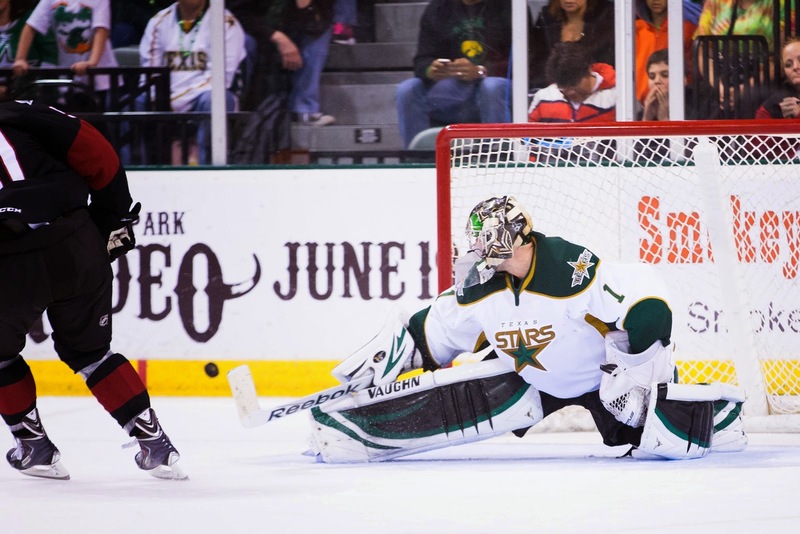 The Stars went to their second shootout of the year, a place where they've yet to win on the season. "We haven't had a lot of success this year," said Laxdal. "So we were going with the guys we knew, Smith and Ranford. You know, it'll be an HBO moment. Let's throw Morin in there. It was a little bit of karma that it worked out." Morin looked far side and shot short side on Pickard for the win in the fourth round of the shootout after Brendan Ranford and the Monsters' Vincour each scored in the initial three rounds. Texas hits the road for a string of games in the Midwest. Henri Kiviaho will join them in Chicago tomorrow to back up Jack Campbell. 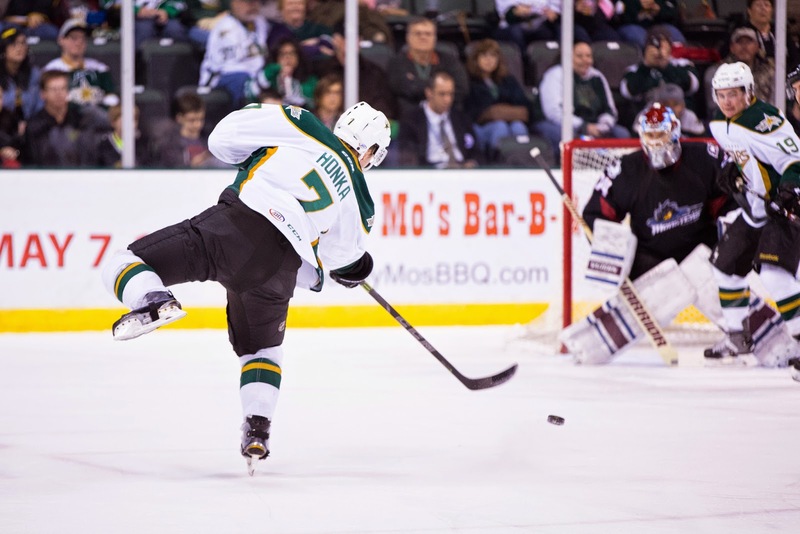 The Dallas Stars have reassigned defenseman Jamie Oleksiak to the Texas Stars this morning. The 6'7" defender has split time between the NHL and AHL this season and will be available for tomorrow's game against Lake Erie. 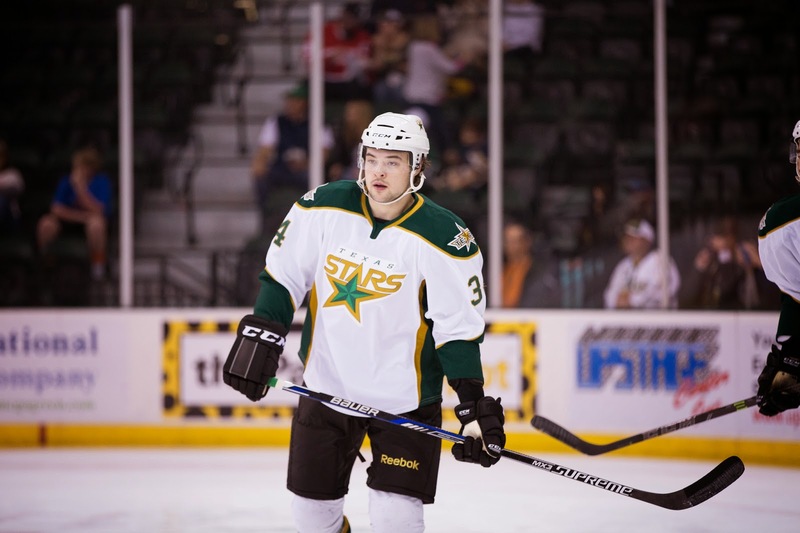 In an unrelated move, the Texas Stars released rookie PTO forward Eric Faille. Faille had 2-4=6 in 21 games with Texas this season but was scratched the past two games. With the arrival of Devin Shore, Faille just gets squeezed out on the numbers game. I personally think he'll pick up some PTO games elsewhere out East in the AHL in the final month of the season. 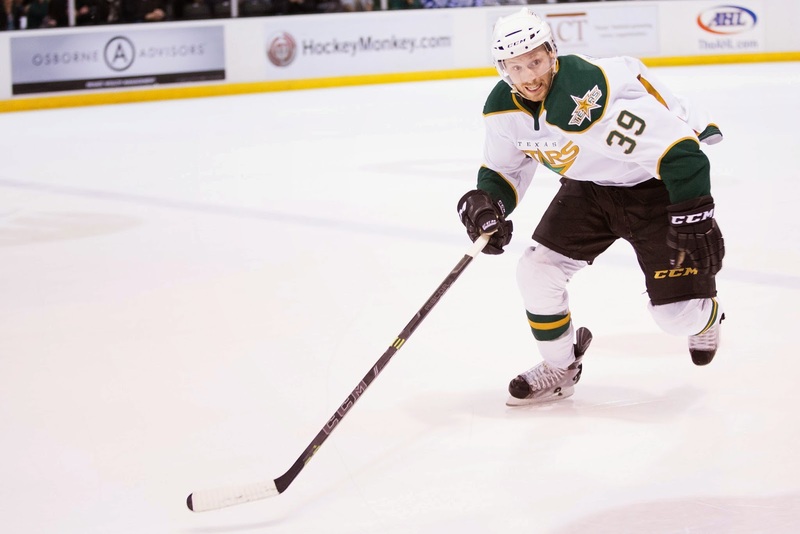 Dallas Stars General Manager Jim Nill announced today that the club has reassigned defenseman Jamie Oleksiak to the Texas Stars, Dallas' top development affiliate in the American Hockey League. Oleksiak, 22, has appeared in 36 games for Dallas this season posting eight points (1-7=8) and eight penalty minutes. He has also appeared in 19 games for Texas this season and registering 11 points (3-8=11) and a team-leading +11 plus/minus rating. There's something in these Texas Stars now that hasn't been there all season, according to Coach Derek Laxdal. After the Stars' 6-2 throttling of the Admirals tonight in Cedar Park, he opined that this is a team finally playing with passion and for each other. "That's a team. That's passion. We hadn't seen that, and we're seeing it now. Any team, you have to play for the guy beside you. When you have that trust in your group, it can be a powerful thing." Texas got contributions from all over the lineup as they completed the two-game set against Milwaukee with a huge four points. Laxdal pointed out, correctly, that it is more accurately an eight-point swing since Texas is right behind Milwaukee in the standings. The game was so complete by Texas that there are at least half a dozen different angles you could take on the game. Jack Campbell had his first win since December and looked very good stopping 36 of 38. 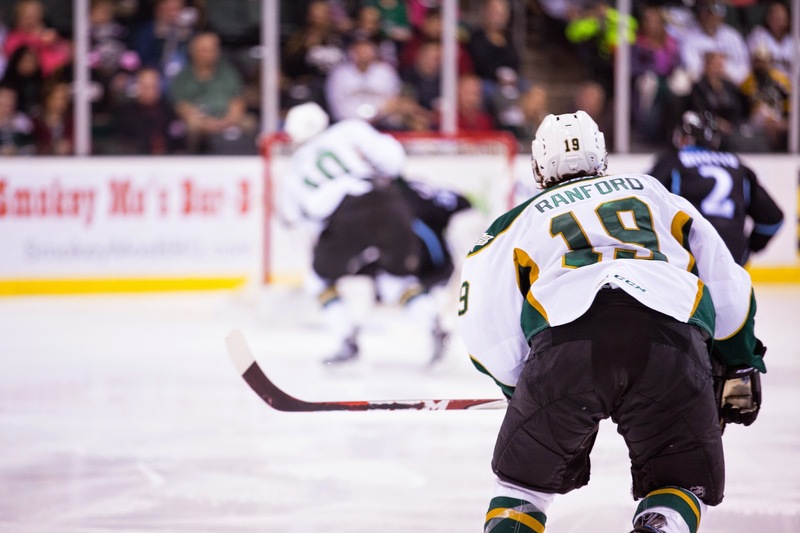 Brendan Ranford scored two, clicking with his linemates and playing his best hockey since being reassigned. Former Ads Scott Valentine and Kevin Henderson both scored against their old team. Branden Troock assisted on each of those goals and had a pretty stellar night as well. Brendan Ranford expanded, "I thought we played well. Every line contributed on the night, and it was a good night for everybody. That's what we needed." To put it simply, this team is very dangerous right now. After a sleepy first few minutes, Ranford scored his first of the game on a sweeping backhand move. He beat Marek Mazanec, starting for the second straight game, farside for the 1-0 lead. Viktor Arvidsson tied things up less than a minute later on a breakaway where William Wrenn got burned by the footspeed of the young Swede. Texas would go up for good on Henderson's goal just 49 seconds later. "Henderson is on a streak here," said Coach Laxdal. "He's scoring about every other game. He had about four grade A scoring chances here. Branden Troock also had a good game tonight." Troock passed to Henderson in the slot, where the former Ad roofed the puck for the 2-1 lead. The second period was all Texas and started with a fantastic play by Scott Valentine. The Stars managed to force a turnover and Branden Troock raced to the puck in the Milwaukee zone. Scott Valentine lifted Troock's pass under the armpit of Mazanec as he fell to the ice. "The effort on Valentine's goal to score was second to none. He showed a top notch effort to skate on to that loose puck." Scott Glennie added his 11th of the year a minute later to make it 4-1. As the period wore on, Texas found itself on the PK a few times, needing a big performance from their goalie. Jack Campbell, looking for his first win since December 20th, stepped up. "My game is starting to feel better," said Campbell. "The guys played really hard in front of me, allowing me to see the shooting lanes and clearing our rebound." Laxdal added, "For Jack to get in there and face a lot of shots and get the win, that's going to build confidence for him. We have a heavy schedule so we need two goalies." 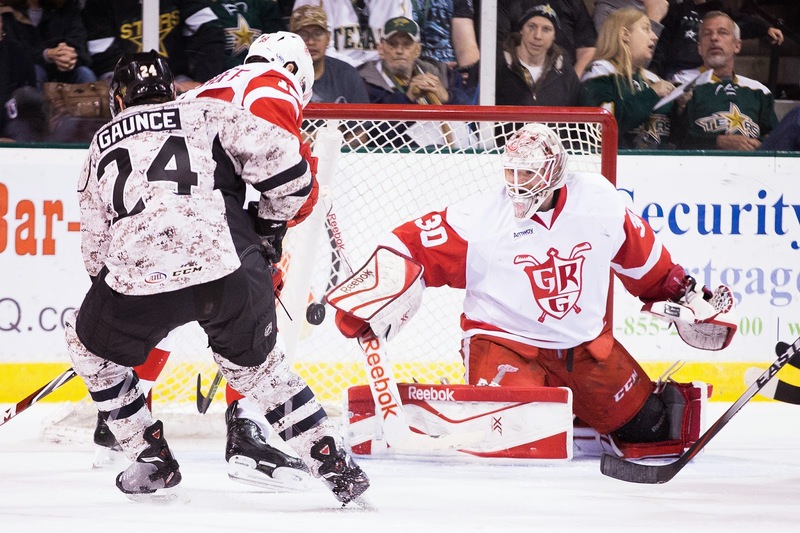 Brendan Ranford closed the period with a rebound goal to make it 5-1 and take the pressure off the third period. Ranford looked solid for the first tiem since returning from Dallas. "I think the last three games I've been better," he said. "The first four coming back were not great my greatest games all season, probably the worst stretch I've had. Playing with Dowling and Glennie has been really nice." Newcomers Devin Shore and Ludwig Bystrom both got extended looks in the third period, including a PK shift for Shore. Texas and Milwaukee traded goals in the frame. Derek Hulak scored on the first shot of the period against backup Magnus Hellberg. Viktor Arvidsson got his second of the game on a redirect in front. The Stars will stay in town to play Lake Erie on Tuesday. Texas dressed seven defenseman tonight. Matt Mangene played fourth line forward on some shifts and defense on others. Laxdal on Bystrom: "For a guy that flew in last night, he was fine. He didn't look tired. We ran him hard in the third to get some experience. He snapped some passes and played hard." HDH: What's been the story of the season overall? These teams haven't played, so Texas fans have no context. DL: Our season has been hot and cold. When it's hot, it is really hot. We opened with a franchise record six-game winning streak to start a season. January was also fantastic for the Admirals as well. Then there are the cold stretches such as December, February, and right about now. The mantra for much of this season has been "play the right way" and a lot of the comes down to simplifying the game and minimizing mistakes. Our cold stretches tend to come from getting out of that philosophy. Simply put: When it is good - it has been very good. When it's bad - it is rough. HDH: Milwaukee was hot hot hot in January and February, winning 13 of 15. Since then, they've been 3-7-2. What's changed? DL: I feel that there are a few things that contributed to this current skid. The biggest change was probably the first real injury bug of the season which were almost all on the defensive end of things. The Nashville Predators had some bodies banged up and it led to Anthony Bitetto going up all while Joe Piskula, Jimmy Oligny, and Johan Alm were injured. The great news is that all those names have since returned but for that brief while we made due with Jaynen Rissling from the Cincinnati Cyclones of the ECHL getting his first AHL action of the season, signed hired gun to the AHL this year Jared Nightingale to make it his fourth stop with a different team in the league this season, and even played left winger Mike Liambas in defense for a few games. I also question how big of a loss to the Admirals Brendan Leipsic has been since the Predators traded him as part of their deal to acquire Cody Franson and Mike Santorelli from the Toronto Maple Leafs. Leipsic was our leading scorer for the better part of this season and was a real spark plug for the offense. Since his absence Kevin Fiala, who pretty much just made the leap to North America, has been tasked with filling his wing role. Fiala is still adjusting and a guy like Colton SIssons has really been picking up the offensive slack where Leipsic left off. It's still a drop off for the Admirals since Leipsic left. The sooner they find some consistency in their forward make-up the quicker the results can stabilize. 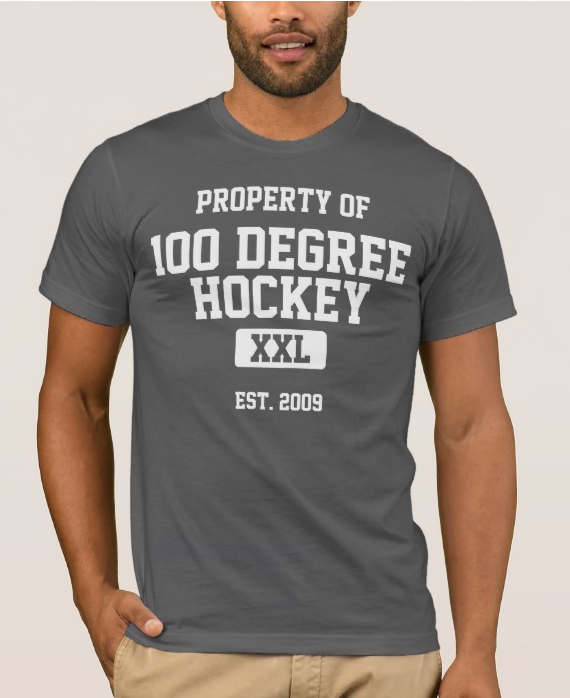 HDH: Is it the same formula as always for these Ads: defense and goaltending? DL: The goaltending has been phenomenal this season. Both Marek Mazanec and Magnus Hellberg have really played great all season long. While some of their numbers, especially recent, may suggest struggles I would say that's a bigger reflection of the team in front of them than solely their fault. Mazanec has looked much improved than he did last season. He's been very calm and confident in net. And Hellberg looks just as good as he did at the end of his stellar rookie season for the Admirals. Goaltending has been one of, if not the, biggest pluses on the season. HDH: Who should we be watching? DL: Viktor Arvidsson should be a man fans in Texas watch out for this weekend. He was the Predators fourth round selection in the 2014 NHL Draft and he currently leads the entire AHL in shots on goal with 224 for an average of 3.7 shots per game. He might not be the biggest bloke on the ice at standing at 5'9" but his slap shot is a nasty one. He generates some serious pop with his shot and is really skilled when it comes to his playmaking ability. The other obvious name worth throwing out is the Predators first selection from that same draft class, Fiala. He's had a slow adjustment period since joining the Admirals in late-January from HV71 in Sweden. The North American game is something he is still getting used to: pace, defensive closing rate, etc. Still, he has shown more than enough times that even at 18-years old he is incredibly talented. He skates really well and his stickhandling abilities remind me a lot of a guy we had last season named Filip Forsberg. Crazy hand speed. The more comfortable Fiala gets the better and better the team around him is going to get. HDH: Talk about the resurgence of goalie Magnus Hellberg. We saw him in the playoffs two years ago, and he was great. He had a weird year last year and now he's back in the AHL. What's up? DL: Last season was about as rough as they get for him. He picked up an injury in pre-season camp in Nashville and he never truly got his motor going. Scott Darling was our ECHL guy last season and his play for the Admirals, during the system-wide goalie shuffle with Pekka Rinne's injury, had him leap Hellberg with the big Swede ending last season on the bench watching Rob Madore's MVP run for the Cyclones in the Kelly Cup Finals. Since the start of this season it has been a different story. He's healthy. Not that it was a problem before but I think last season grounded him and kept him humble to keep things day-to-day and one game at a time. He never gets frazzled by who gets more starts, Mazanec or himself, and both goaltenders really support and feed off one-another to get going. It didn't take him long to eclipse his numbers from a year ago and it really is a matter of goalie "1-A and 1-B" than one over the other. Thanks to Lavender and the Admirals Roundtable crew for reaching out. 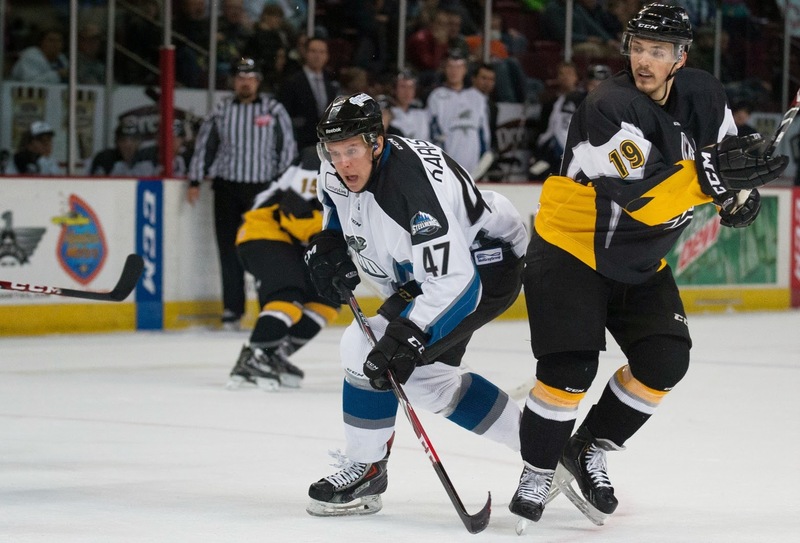 Forward Ludwig Karlsson and defenseman Troy Vance have both been reassigned by the Dallas organization to the ECHL's Missouri Mavericks. The move was part of a trade arrangement between Missouri and Idaho that involved NHL-contracted players. 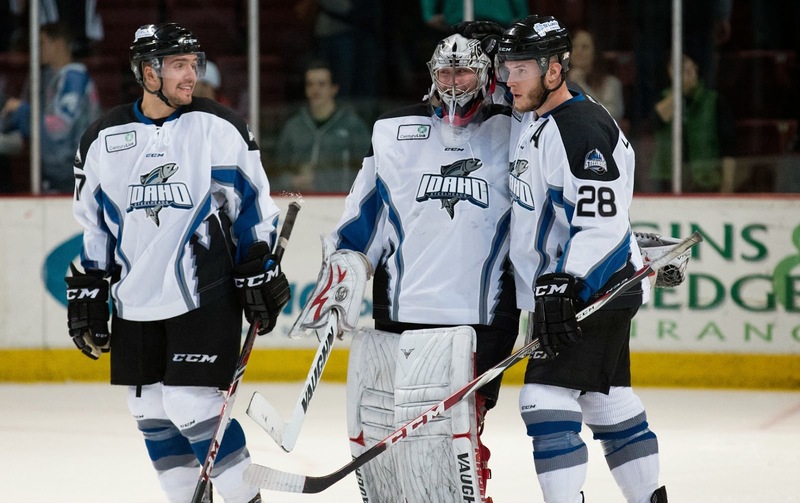 Both Karlsson and Vance have played all season for the ECHL's Idaho Steelheads, the AA affiliate of the Dallas and Texas Stars. The trade will allow Karlsson and Vance to get more playing time down the stretch. Missouri is not projected to make the playoffs, currently in 6th in the Central Division. 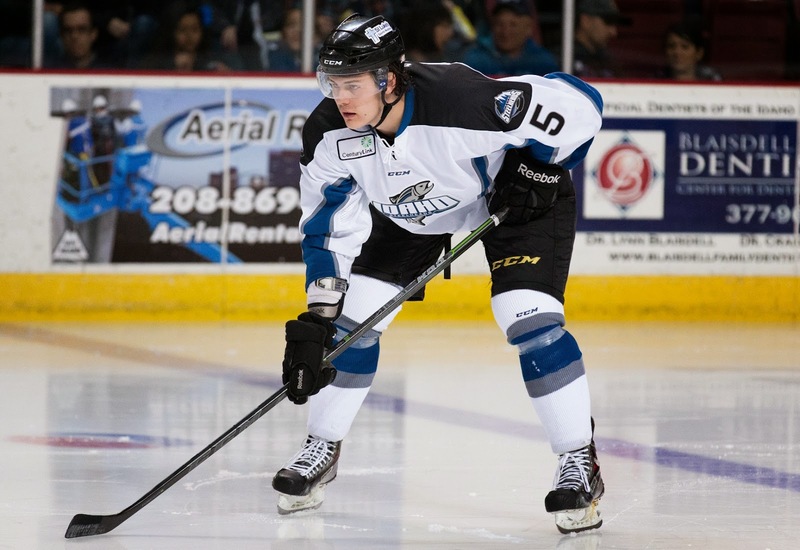 Defenseman Martin Lee will be joining the Steelheads from the Mavericks. Lee is a three-year vet of the ECHL and is on an ECHL contract. 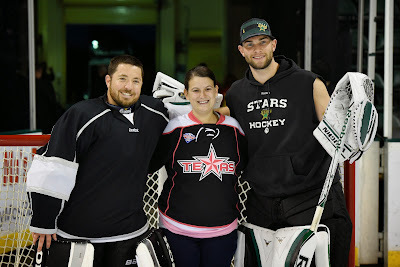 Texas Stars GM Scott White was not available for comment.